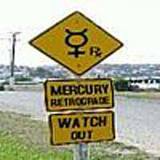 Since I’ve known about Mercury Retrograde, it seems that a spotlight is shining on all of the delays, technical glitches, and communication gaps that happen during this period every time. And I’m wondering about it. Here’s what I’m wondering. The slight over-sensitivity to all things wonky is making these incidents memorable. What I mean is, because I know it’s Mercury Retrograde, does that make me more aware of their existence, and subsequently more annoyed by them? Last Mercury Retrograde, I felt like my life was completely kicked around. My computer had issues, my website had issues, my phone had issues, payments were delayed…and I was exhausted from it all. Everything that happened, I remember blaming on Mercury Retrograde. When it was over, things seemed to be back to normal. But back to normal doesn’t preclude some things going wrong. That happens. But they don’t seem to have as much of an impact when I’m not so hyper aware of them. Is my awareness that it’s Mercury Retrograde, and I know that things could go extra-glitchy, actually manifesting these extra glitches? I have learned that the energy of expectation is a powerful creator. I know that first hand. So if I’m expecting glitches, does that logically mean of course that’s what I’ll be getting? Our minds are naturally prone to trying to make sense out of life. We look for patterns and derive meaning from them. When things are consistent or predictable, we feel safe and like the world has order. So wrapping a lot of chaos into a package labeled “Mercury Retrograde Strikes Again” is somehow reassuring. But are these things really happening because of the shift in planetary motion, or are we just organizing them that way in our little insecure brains? When I lived in my blissfully ignorant about all things Mercury Retrograde state, I don’t recall having such intense 3 weeks of wonky. Maybe I should try ignoring astrological warnings for a change. My husband reads the daily horoscope in the paper. He used to get kinda discouraged at the start of the day if the horoscope predicted a mediocre or unpleasant day. I would tell him to not read it, because it would set him up for that kind of day. It’s a cause and effect idea, or maybe the chicken and the egg. Is the planetary placement setting us up for a problematic day, or is knowing about it setting us up? Or if we have a strangely glitchy day, should we read the horoscope then to try to make sense of the seeming randomness? I welcome any input on this possibly backward reasoning.